El Parque Del Retiro is one of the two big parks in Madrid, along with the Casa Del Campo. 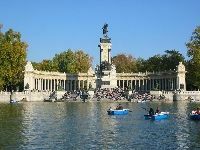 Very close to the famous Museo del Prado, it has attractions such as the Palacio de Cristal or the little lake situated in the centre of the park. Perfect for open-air activities such as jogging, it's better not to go there on your own in the evening. On the outer perimeter of the park, between Calle de Alcal and Avenida Menendez y Pelayo, there are residential blocks, built in the last century, usually six or seven storeys high. Close to Madrids biggest railway station, Atocha, and not far from the centre, its a quiet residential middle-income area. Parking is not a problem, but there are not many shops and markets.